At Home Network, 2018. 06. 04. Strauss? Schnitzel? Skiing? Mozartkugeln? What is the first thing that comes to your mind when people mentionAustria? Not just the country, but the capital city also looks back at a great history, still, not many know that there is a separate ‘village’ situated on the left coast of the Danube in Vienna. UNO City forms a separate village in the Austrian capital. This gives home to several international organizations, for instance; to the International Atomic Energy Agency, the International Commission for the Protection of the Danube River, the Preparatory Commission for the Comprehensive Nuclear-Test-Ban Treaty Organization and most importantly, to the United Nation Offices of Vienna. UNO City (Vienna International Center) is considered as an extraterritorial area and employs around 5,000 people. It is truly like a separate city. Not only because it is exempt from the jurisdiction of local law and the volume of people employed here, but also because it offers shopping and catering facilities; furthermore, it is equipped with two banks, a post office, travel agencies and other commercial services. The complex officially opened on 23rd of August 1979 after six years of construction. It is in walking distance from the Danube Island, the recreational paradise of Vienna. 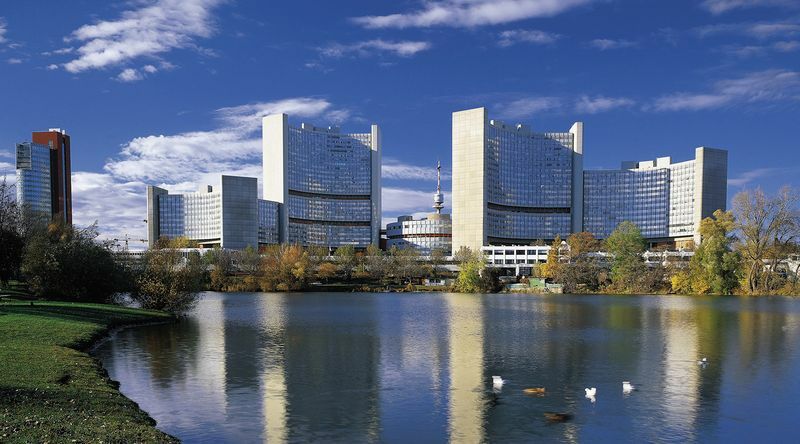 Vienna is the only European Union city to host UN headquarters along with New York, Geneva andNairobi. There are daily guided tours at 11am and 2pm, where visitors can learn about the work of the United Nations and can experience the vibrant, cosmopolitan atmosphere of the Vienna International Center. Check out some apartments nearby!